Spring is finally here and we’re all ready to get out and enjoy some fun! With a late Easter this year (April 21, 2019), we have lot of opportunities to get out for a fun Easter Egg Hunt. And the egg hunts aren’t limited to kids! There are a few options for adults in this list and there’s even one for your favorite doggy companion! Please note: most of these events are weather dependent. Be sure to check with the event (links below) before you head out the door. Did we miss an Egg Hunt? Let us know in the comment section. Have some fun at the 2nd Annual Adult Easter Egg Hunt (benefitting the Ross Rambotics Team). Four egg hunts feature a mass start where participants gather as many eggs as possible. Some eggs will have numbers inside them to exchange for great prizes! Hunt #1: Golden Hunt (age 50 and up); Hunt #2: Partner Hunt (two people tied together at the elbow); Hunt #3: Adult Egg Scramble (age 21 and up); Hunt #4: Teen Egg Scramble (ages 13-20). See full details at the link above. 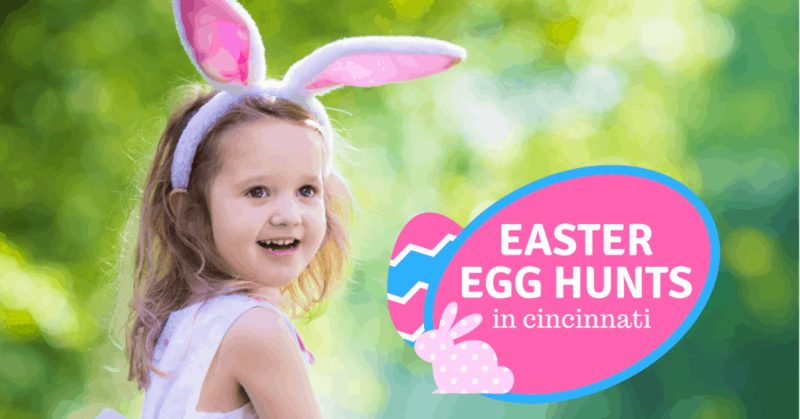 The Great Underwater Egg Hunt is happening at all YMCA locations around Cincinnati. Open to the public. From 12 -2pm, except Highland and Clippard 1-2pm. Ages 12 and under. Non-swimmers must have adult supervision. See event link for full details. The YMCA at Duck Creek is hosting their annual Egg Hunt. Children ages 0-10 can come collect eggs in the field. Fields will be separated by age group so each child has a fun, safe experience. Kids will also have the opportunity to bounce in a bouncy castle or race through the bouncy obstacle course! The Egg Hunt will begin at 3:30pm. Head up to Forest Run MetroPark (Hamilton) for a Flashlight Egg Hunt. Starts at 8:00pm. Registration required (by 4/10/19). $5 per child. When the park is dark, your flashlight will be your guide! Bring your own flashlight and join in the fun! Egg cartons will be provided for collecting. Egg Hunt at Washington Park – Over-the-Rhine’s biggest egg hunt returns to Washington Park Saturday, April 13! 10,000 candy filled eggs. Photos with the Mr Bunny. Games, animals and inflatables. Bring your own container and hunt for 6 eggs. This event is FREE and open to the public. 10am – 4pm. (hunts are broken up by age range: 11am = 3-6 yrs, 12pm = 7-10 yrs, 1pm = 3-6 yrs, 2pm = 7-10yrs). Head to The River Church (Liberty Twp.) for a Helicopter Egg Drop (rain or shine). This event is for kids from 2 years old to 5th grade. 9-11am. This is a pre-registration for the event and you will still need to check-in on the day of the event.There will be NO walk-up registration available. Rentschler MetroPark is hosting an egg hunt designed for dogs! Put their nose to the test as they sniff out a dozen treat filled plastic eggs. They will even receive a new toy as an extra reward. Some activities include: shopping at dog-friendly vendors, concessions, dog obstacle course, socializing time, and photo opportunities! Hunt times are scheduled by weight: 12:00 p.m. – Registration/Check-In Opens, 1:00 p.m. – Dogs Under 30 pounds, 1:15 p.m. – Dogs 30-50 pounds, 1:30 p.m. – Dogs 50 pounds and over. See site for additional event rules. Anderson Township Parks has an ADULT Easter Egg Hunt (requires advanced registration) starting at 7pm. Be sure to check out the event page for full details. Four egg hunts (by age group) feature a mass start where participants gather as many eggs as possible. Redeem “special” eggs on-site for prizes. Registrations accepted first-come, first-served and space is limited. Register in advance. Metal cleats and pets are not permitted. Not recommended for children to attend. Cost: $5 per person, per hunt. Head up to Elk Creek MetroPark (Middletown) for a Flashlight Egg Hunt. Starts at 8:00pm. Registration required (by 4/17/19). $5 per child. Deerfield Township has two sessions for their egg hunts – 10am and 11am, both at Cottell Park. There are two age-divided fields for the Easter Egg Hunts (4-6 years old and 7-11 years old). Have a toddler, no problem! The Egg Patch is a low-key, small group, egg hunt for wee ones. Free activities and giveaways for the whole family! Florence Police Department Easter Egg Hunt: 10 a.m.-2 p.m. UC Health Stadium (Florence Freedom Ballpark), 7950 Freedom Way. Benton Family Farms will be on site with lot of Easter babies for everyone’s enjoyment! The Cincinnati Zoo hosts its annual Easter Celebration. Includes treat stations throughout the park, children’s activities, popular animal egg hunts and visits with the Easter Bunny. Back by popular demand: Search for the Golden Eggs! There will be four “Golden Eggs” hidden around the Zoo. If you find one turn it in at the Welcome Center for one of four great prizes! 12-5pm. Swine City Brewing (Fairfield) is hosting a Family Day followed by an Adult Egg Hunt (in the dark). From noon to 4pm bring out the whole family for egg coloring and other great activities including a just for kids egg hunt starting at 2pm. When the sun goes down call the babysitter and grab your flashlights. They’re turning off the lights and letting everyone lose for an adult egg hunt in the dark starting at 8:30pm. Collect all the eggs you see for your chance to win great prizes like merch, gift cards, and of course CANDY! Easter Egg Hunt hosted by the City of Wyoming and the Wyoming Fire Department. Event takes place at the RecCenter on the Turf Field. Music, treats and the Easter Bunny. 1:30 pm. Easter Brunch at Great Parks of Hamilton County. Celebrate the holiday with the Easter Bunny and enjoy an all-you-can-eat buffet. “The Bellevue Band of Gold is once again ‘bringing the Bunny back to Bellevue’ for our annual Lunch with the Bunny and Easter Egg Hunt, Saturday March 31st at Gilligan Field/Ben Flora Gymnasium in Bellevue. Doors will open at 10:30 am. The Easter Egg Hunt will begin at 11:00 am for children ages 0-12. After the Hunt, join us for Lunch with the Bunny, carnival games, crafts, raffles, pics with the Bunny and lots of spring time fun! The Easter Egg Hunt is free! The Lunch with the Bunny is just $5.00 per child and includes lunch, drink, dessert and 5 game tickets. Additional concessions and game tickets will also be available for purchase. Hop on down and join us Saturday the 31st from 10:30 am until 1:00 pm. This event is a fundraiser for the Bellevue Band Programs at Bellevue Middle School and High School. All profits go directly to support the students in the band programs. THIS IS A RAN OR SHINE EVENT!!! Join the “hunt” for Easter Eggs at Our Lady of Peace Church grounds on Saturday, March 24, at 11:00. We are located at 119 Wocher Ave., off River Rd. In Delhi. Be a good egg and win a prize! Happy hunting!